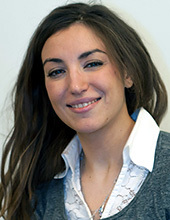 Ilaria’s research deals with methodologies for sustainability assessments of production systems. The focus in on the whole triple bottom line of sustainability: economic, environmental and social. The ultimate goal of her research is to provide the decision stakeholders of the manufacturing industry with meaningful information for more aware decisions oriented towards sustainability.Her main contributions so far consist of novel energy efficiency key performance indicators for machine tools and a methodology to assess sustainability impacts in e-waste treatment facilities after reconfiguration operations.She worked on the VINNOVA-funded project WEEE-ID and the EU-funded project SO SMART.She is currently working on the 5GEM project, whose goal is to enable world-class manufacturing through 5G technology. She will assess the sustainability impacts stemming from the 5G technology implemented in production.She is currently working on a model for assessing the ”sustainability maturity level” of manufacturing companies. There might be more projects where Ilaria Giovanna Barletta participates, but you have to be logged in as a Chalmers employee to see them.